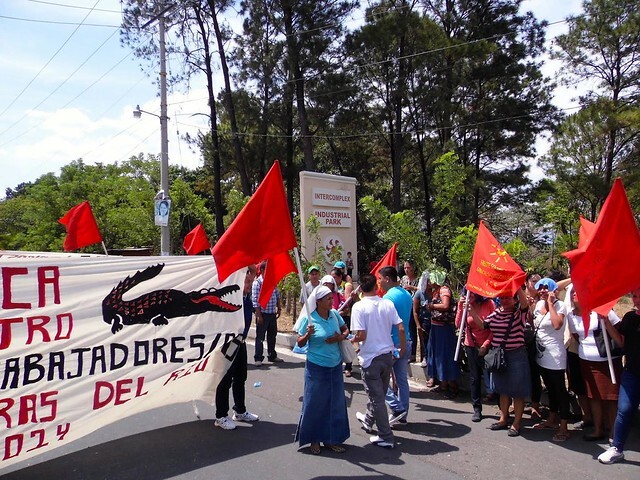 El Salvador: Workers' Action Forces Lacoste to the Table! Integra Textiles company, representing Lacoste brand in El Salvador, was forced to the negotiating table when fired workers took action directly targeting Lacoste for its illegal union busting activity after the illegal closure of their factory due to workers organizing a union with League member STIT-FUERSA! Integra-Lacoste had been dodging its responsibilities to the illegally fired workers for months, despite other buyer brands from the same factory rightly committing to take responsibility to ensure workers are compensated fairly and in good faith. Workers were forced to take action, making clear that they know Lacoste brand has the power to ensure their fair treatment. After the workers held a protest in front of the Intercomplex Industrial Park clearly calling out Lacoste for dodging its responsibilities, Integra-Lacoste was forced to come to the negotiating table directly with the around 1,200 workers who lost their jobs around a year ago. Representatives of the PDDH (Agency to Defend Human Rights) who were present confirmed that the company had received a letter from the union and promised to participate in the dialogue that is developing under the direction of the Ministry of Labour to ensure the workers receive their just compensation.